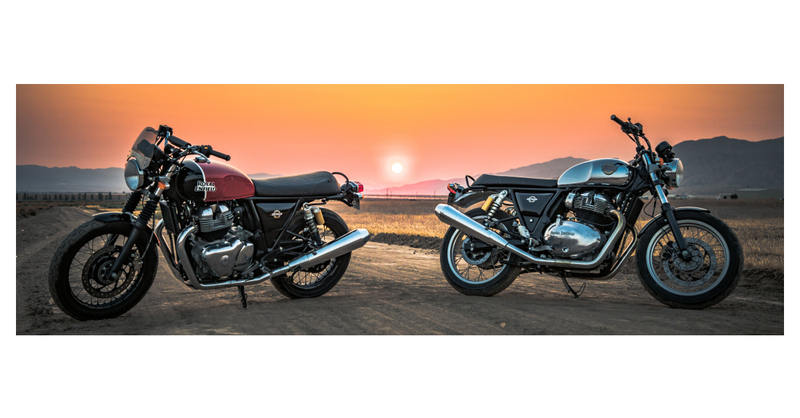 SANTA CRUZ, Calif.–(BUSINESS WIRE)–Royal Enfield, the leader in the global middleweight motorcycle segment, has officially announced the North America timing and pricing for the highly anticipated twin motorcycles – the Interceptor INT 650 (North America: INT 650) and the Continental GT 650. The new models will be available at North American dealers in spring 2019 and will start at MSRP $5799, which will include ABS and a 3-year warranty with roadside assistance. Sold mainly in the U.S.A. and Canada, the 700 Interceptor and its 750cc successors quickly became part of California's sun-drenched culture, serving as two-wheeled expressions of fun, excitement, freedom and optimism in the form of fast and stylish road bikes and as competition machines that enjoyed huge success in scrambles, desert races and flat track events. And it is Royal Enfield's historic links with the Golden State that partly inspired the choice of Santa Cruz for the launch of the Continental GT 650 and Interceptor INT 650 which, as well as marking the revival of twin-cylinder production, also herald the start of the brand's global expansion. Celebrated alongside a first global ride, these motorcycles will be priced at USD 5799 for the Interceptor INT 650, and USD 5999 for the Continental GT 650, for the Standard colorways, making these motorcycles a perfect blend of authentic appeal, contemporary fun ride experience, and accessibility. The Custom and Chrome colorways will be priced at USD 5999 and USD 6499 for the Interceptor INT 650 and at USD 6249 and USD 6749 for the Continental GT 650 respectively. Despite their links to the past, the Continental GT 650 and Interceptor INT 650 are entirely new motorcycles from the ground up, developed jointly by Royal Enfield's development teams located both in India and at its state-of-the-art technical centre at Bruntingthorpe in UK. The motorcycles – the Continental GT 650, a sporty cafe racer, and the Interceptor INT 650, a stylish roadster – combine classic looks with carefully considered engineering that has resulted in a brace of machines with a common engine that will inspire confidence in new riders as much as they will satisfy the expectations of more experienced motorcyclists. Un-fussy motorcycling is what Royal Enfield's new twins are all about. While offering a more than adequate 47 horsepower, the secret of their 'ride-ability' lies in the way their torque is delivered – seamlessly, and from low in the rev range – with 80% of the peak 52Nm torque delivered at 2500rpm – enabling smooth and steady progress without the need for constant gear-changing. Combine that with an extremely agile chassis developed at Royal Enfield's UK Technology Centre in conjunction with legendary sports bike frame builder Harris Performance, and the secret of the all-round competence of the new motorcycles begins to reveal itself. But the Continental GT 650 and the Interceptor INT 650 offer a great deal more than accomplished engineering – they tap-in to the growing popularity of classically-influenced, modern-day motorcycling that has been at the heart of Royal Enfield's ethos for decades. The new twins, like the famed, single-cylinder 'Bullet,' are motorcycles that are inspired by the past but built for today and designed to remain relevant tomorrow – as such, they reflect the marque's respect for longevity by being the definition of two-wheeled sustainability in a world where short-term trends, conspicuous consumption and disposable products are fast losing their appeal. Increasingly, today's motorcyclists see their machines as extensions of themselves; motorcycles that they can make their own and ride throughout the adventure of life. The Continental GT 650 and Interceptor INT 650 are intended to be just such machines that, though similar at heart, offer very different riding experiences. The Interceptor INT 650, meanwhile, harks back to the historic model after which it is named, with its distinctive teardrop tank with traditional knee recesses, comfortable, quilted dual seat and wide, braced handlebars redolent of the street scrambler style that emerged in '60s California. Its comfortable and commanding riding position make the Interceptor INT 650 both fun and practical on all types of terrain, from curving coastal roads to the urban jungle, for heading out of town two-up or for cruising down to the beach. Both the Interceptor INT 650 and the Continental GT 650 are beautifully executed and thoughtfully detailed motorcycles. Their engines, though of up-to-the-minute design, perfectly replicate the classic look, while touches such as forged handlebars, 'Monza' fuel caps and carefully finished ancillaries echo the quality to be found inside and out. With individuality being key to today's riders, both the Continental GT 650 and the Interceptor INT 650 can be had in Standard or Custom versions with a wide range of retro options ranging from special paint colors and pin stripes to retro-cool bar-end mirrors, optional fly screens and alternative finishes for items such as wheels, lights and suspension components. The significance of these machines to the future of Royal Enfield is huge. Just as the original Interceptor made the marque a hit in America, so the Continental GT 650 and Interceptor INT 650 are set to ignite the mid-weight motorcycle segment in emerging markets such as India, South-East Asia and Latin America while providing a new and disruptive option to buyers in Europe, Australia and the United States. Royal Enfield North America (RENA) is headquartered in Milwaukee, Wisconsin, and is developing a growing network of 90 dealers in North America, including the U.S., Canada, Mexico and Puerto Rico. RENA currently offers the Bullet 500, Classic 500 and Himalayan motorcycles along with a range of genuine motorcycle accessories and apparel.